In general on a busy Saturday we have an average of 9-14 groups hunting approximately ⅓ to ½ of all our duck ponds (not counting our private marsh system), leaving a good portion of our properties and ponds rested. We hunt only one group per pond and on average a pond is hunted once, maybe twice a week. We hunt ducks on Wednesday, Saturday, & Sunday only. For the upcoming 2018/2019 Season additional habitat improvements are scheduled to enhance our hunting even more. 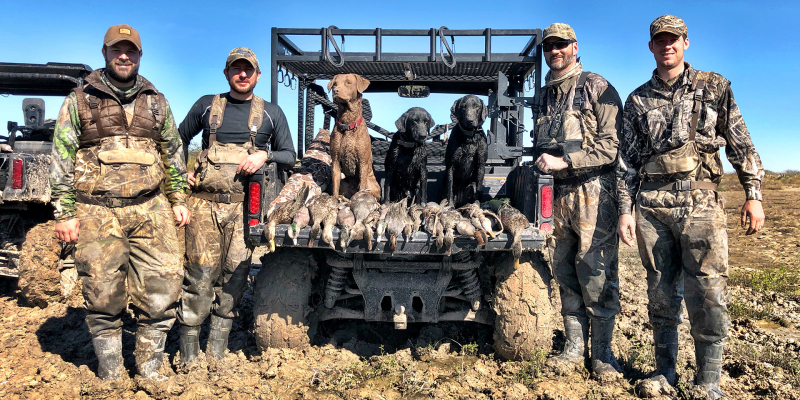 We feel the size of the club is perfect, not to large to be impersonal or unable to learn in a season, but large enough to rest waterfowl properly and move members around to hunt concentrations of birds. Thunderbird supplies a multitude of different duck blinds including pit blinds (fiberglass, metal, & concrete), portable cage blinds (can be moved with ATV), and portable blinds in sleds (to allow setup in remote areas of ponds). The use of portable blinds enables us to hunt the “X” of feeding birds. If you are not hunting the “X” you are not shooting full straps. The club also supplies camouflage materials with “fast grass,” cane, and natural materials. We try to have at least one permenent duck blind camouflaged with two dog porches on each pond along with at least 100 club-supplied decoys, “Texas-rigged” for easy deployment in the morning. A single word sums up Thunderbird…consistent. We adjust and maintain the habitat with our proven management plan through droughts, floods, mild weather, stalled migrations, it just does not matter, we shoot birds season after season, and all on an unguided basis. In fact our duck hunting is better than most guided hunts!